Kamus is an English-Indonesian Dictionary and vice verse. 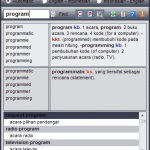 This program is released as freeware for personal and non commercial use. For other uses just email me. Many software dictionaries are available, this one is different from the others, it tries to facilitate the translations and also helps in reading. 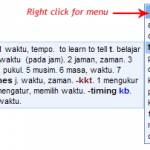 Automatic search between English and Indonesian languages. It will search English-Indonesian First, then if no word was found, it will try to find Indonesian – English. You can select individual languages. Compact Mode, is an additional feature that may be very handy when you need to translate some text while you are reading. It was designed with a small form and only shows the text and the result. Find exact word, contained in text or Phrases. More than 41.000 English-Indonesian words, 35.000 Indonesian-English words and more than 64.000 phrases. Pentium II or above with 32 MB RAM. 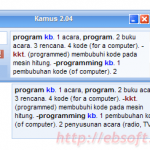 0 Response to "Kamus 2.04 (English-Indonesian dictionary and vice verse) offline installer cuy"